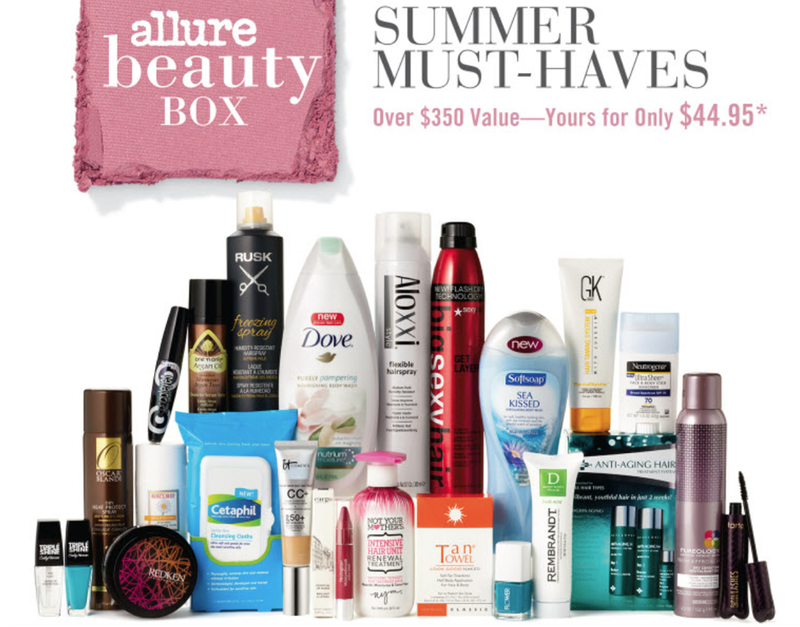 Several years ago Allure Magazine started selling Beauty Boxes. At first they were geared towards sunscreen and skincare but over the years they’ve included, hair care, make up, nail polish and other goodies. They go for sale approx. 4 times per year. They are a great deal considering you get all full size products for around $50 with shipping. I always try to snag one. This Tuesday the box went on sale and due to an epic internet failure they are going to reissue the sale this coming Tuesday (May 6) at 9:01am PST or 12:01 EST. Here is the link for purchase, they sell out almost immediately, click here. The link is not live until 9:01 am but be prepared to order right away. Super Sassy or Super Offensive? I’m working on a new set of greeting cards that I think are pretty funny and snarky with little plays on words. The designs are not totally fleshed out but I thought I would show you a sneak peek. What do you think so far, sassy or offensive? Over the top or just right? 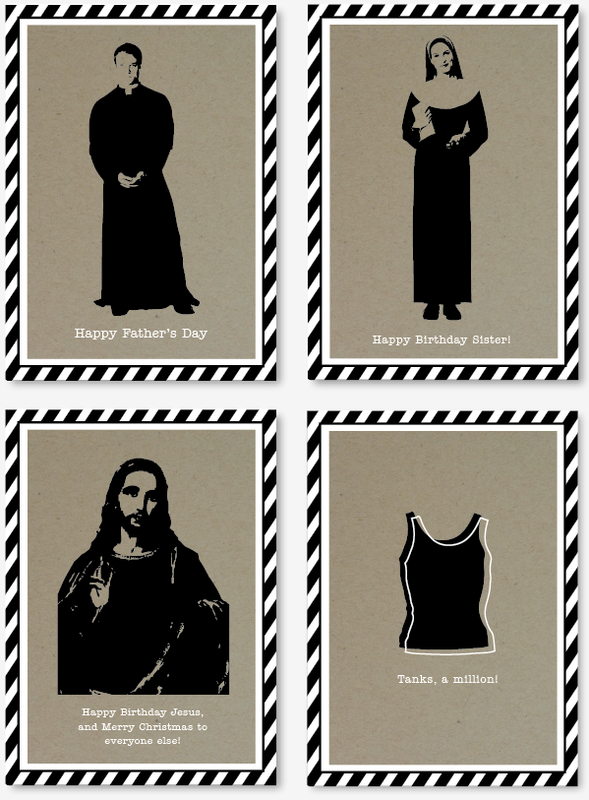 Several will be like the tank top card, just a funny play on words. We would love your opinion! I know all of you creative types know about Etsy, but if you consider yourself “creatively challenged” you may not be aware of the best place to shop in the entire internet Universe. (It might be tied with Zappos, which has more hot shoes than even I can keep up with). Etsy is like Amazon but for super cool, handmade stuff. I fell in love with these sassy earrings, the rest was a big phat bonus. As luck would have it, I have my credit card number memorized in case of an emergency, and well, duh. 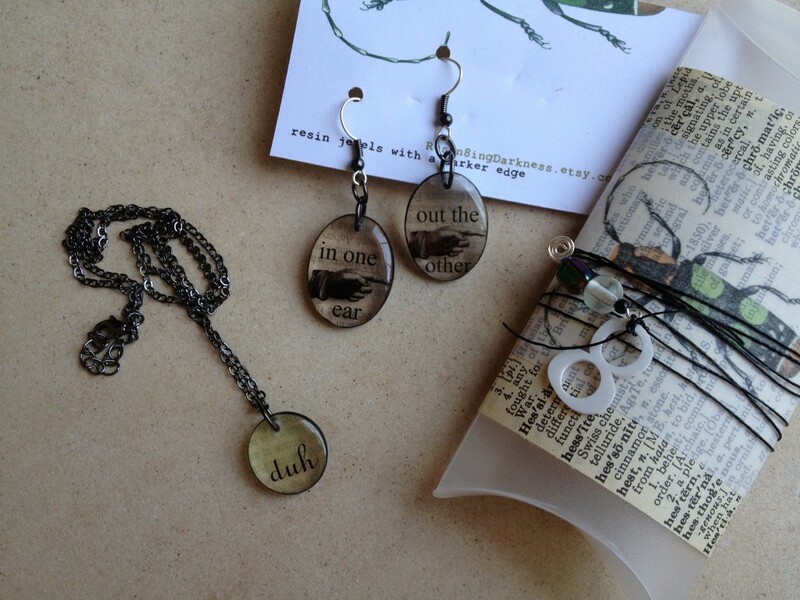 So I sent in my order and commented to the ArtistQueenOfAllThingsResin that these were the best earrings ever. So I was already excited when my package arrived (quickly and inexpensively) and then I opened it and first there was this completely fabulous pillow box with a lucky number attached AND A BONUS NECKLACE with my second favorite word on it. Did she read my mind? No, because the necklace probably would have said f*ck instead of duh. But still. Oh, AND there was a coupon for my next purchase. So if you are looking for a gift for you mom, your sis, your friend or yourself (but not your mother-in-law) go to Etsy. And start with Resin8ingDarkness because if this post entertains you, then so will the jewelry in this awesome store. Since it is so nice and sunny around here and next week promises temperatures in the high 80′s, I thought we should bust out some favorite swimsuits. I always love the way swim suits look in magazines and catalogs but alas, rarely do I find one that I love. I found one at Old Navy several years ago that I LIKED a lot but then lost it when I was leaving my mom’s pool and walking home. I must have dropped it in the street and someone tossed it. Here are a few that I thought were really cute. I love the florals and retro look. They range in price from a great deal to kinda pricey. I never understood why less fabric should cost more! I’m pretty conservative so I usually end up with a tankini, even though my hubby would like a bikini. Maybe if he goes for the speedo I’ll wear a bikini. I have not tried the bikinis at Athleta maybe they have the perfect amount of support since they are for sporty people. Have you tried them? If so let me know what you think. The links for purchasing are below.